Using my phone to take photos of J at a birthday party on Saturday didn’t work too well – he barely ever sat still long enough for me to take a picture! 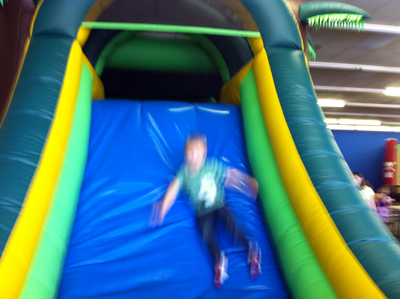 This photo is significant because until Saturday J had always avoided getting on inflatables, saying they were scary. We talked a little in the car on the way to the party – I told him it was ok to be scared, but that if he was brave and tried it, he might end up liking it. Once we got there and he saw all his friends, he saw them playing and having fun. He was tentative at first, but by the end of the party he’d forgotten all about being scared, and had a blast with his friends! I wouldn’t mind trying the Fastest Ever Chicken Enchiladas recipe (http://www.cookingwithcoke.com/hoffmann/h_chickenEnchilladas.jsp). I love chicken enchiladas! Please disregard previous comment. I put this in the wrong section.